Sterling Silver Lemon Agate and Amethyst Anklet (outer) and Bracelet (inner-SOLD). 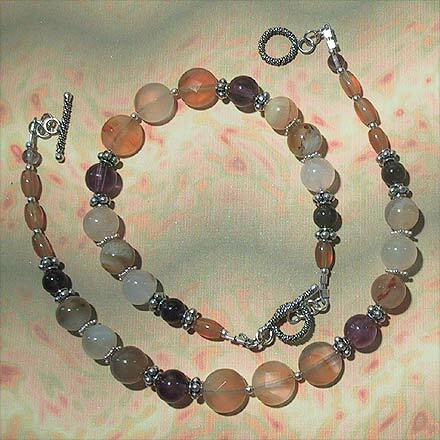 This has wonderful contrasting colors of pale yellow Lemon Agate (light Carnelian) with assorted tones of Amethyst from light to dark. The anklet is 9¾". For those who are interested in Astrological significances of stones, Agate corresponds with Capricorn and Gemini, and Amethyst corresponds with Pisces and the month of February.